Riddle, Riddle, Who Has a Good Riddle? It was riddle contest day at “Can Do” Street school. The “Can Do” Kids were bursting with riddles to share with each other. Miss Pat called the class to order and announced that the riddle contest would we held right after lunch. The”Can Dos” could hardly wait! Wendy was the first to say a riddle: I keep things safe. I have a hole in my middle. A key will open me. What am I? Then Bobby went: I know the numbers 1 through 12. I have two hands. My hands move all day long. What am I? It was Orrie’s turn next: My name is the same as what I do. People try to swat me. What am I? Annie shared a riddle that went like this: I lay around all the time. People step on me, but it doesn’t hurt. Dogs like to sleep on me. What am I? Hector had a good one too: I’m round. I’m made of metal. I have a picture of George Washington on me. Kids save me in a piggy bank. What am I? Nellie shared her riddle: I am made out of wood or plastic. I am straight. Kids use me to measure things. What am I? Which riddle do you like the best? Which riddle was the hardest? Did yo get all the riddles right? Do the Work…Be a Winner! 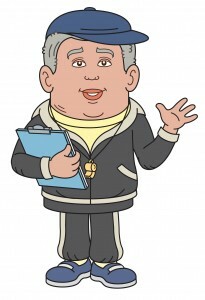 Coach is getting ready for the afternoon session at the Recreation Center. “No Coach, I can’t come today.or any other day for a while,” answered Hector. What? How come, what happened, asked Coach? Hector looked miserable, as he shook his head no. Hector shook his head no. Yeah, I guess,” answered Hector. “Do you remember how you couldn’t do any of the exercises? You couldn’t keep up with the other kids. I remember your telling me you just couldn’t do it,” said Coach. “Oh yeah, and I remember how you got mad at me for saying that, said Hector. “That’s right, you did the work,” answered Coach. “Now you are one of the best in the room. See how hard work pays off? It takes time, but it does make a difference. The last day of camp was sunny and warm, not hot, just right. It was a perfect day for end-of-camp events. There were sack races and three-legged races the first thing in the morning. Then it was time to enjoy the outdoor pool, one last time, as campers. The camp lunch was a picnic on the lawn behind the recreation center. The picnic was a present from Grandpa John’s market of sandwiches, bottles of juice and low-fat ice-cream sandwiches. After lunch, all the campers assembled in the recreation center auditorium for a play and closing ceremonies for the camp. Some of the “Can Do” Kids put on a play about the fun things at camp. Then Miss Sue, the Director, got up and spoke about all the good things that were accomplished at camp. Miss Sue gave out certificates to The “Can Do” Chefs Club for the great smoothies they made for the campers. All the kids in Miss Hattie’s crafts class got a certificate for making the best decoration for the new path …footprint stones! Then it was time for the closing circle. The “Can Dos” sang the camp song. The girls hugged, the boys shook hands. Then it was over. No more camp until next year. Kind of a sad moment, but filled with the promise of all being together next year. There was still a week before school started after camp ended. There was still time to play with friends, that is if the moms didn’t have lots of things scheduled for them to do before school started. Then it’s off to school to learn new things and make new friends! The Can Dos are listening carefully as the historian speaks to them about being children when our country was born. “If you were to journey back over the highways of history to the year 1776, you would find that most people lived on farms or in small villages. Even cities like Boston, Philadelphia and New York were small. Back then, people had no electricity, no indoor plumbing, and no automobiles. Rooms were heated with wood fires and lit by candles. Travel was mainly by horseback over narrow dirt roads. Many American colonists talked of “liberty,” “independence,” and “revolt.” They were weary of Britain’s rule, and their spirit was that of statesman Patrick Henry, who said, “Give me liberty or give me death!” In England, the king and his Parliament responded with more troops and more taxation. The first battles of the American Revolution took place in Massachusetts in April 1775. By 1776, British troops had occupied the city of Boston, and a new American army was drilling under the command of General George Washington. The Britain-America dispute ripped the colonists apart. Many people wanted to remain loyal to their King. Many others wanted freedom at any cost. The King would not give up the Colonies without bloodshed. As battles began to rage, daily life went on. Houses were built, fields were plowed, and children went to school when they could. It is dark when Johnathan’s mother calls him, and he is forced to leave the warmth of his bed. Downstairs, pleasant noises come from the kitchen as his mother prepares breakfast. There will be johnnycake (cornbread), a hot cereal, called mush, and fresh milk. It is the start of another day. Johnathan lives in New Hampshire, a colony settled only three years after the Pilgrims landed at Plymouth. When Johnathan finishes dressing, he hurries down to the kitchen. The wood in the fireplace is giving off a good amount of heat, and the delicious aroma of cooking fills the small kitchen. Johnnycake sits on a clean wooden board before the fire. A kettle of mush bubbles and hisses. Johnathan has three younger sisters. His sister Elizabeth dresses the younger children in a corner of the room. When his father comes in from the barn, the family gathers around a plank table. After a blessing, the parents and the children eat and talk of the day’s assignments. Elizabeth will work on a spinning wheel, while Johnathan will carve new rake handles with his knife. Then both of them will walk to Mistress Robbins’s house for their daily lessons. The younger children will remain at home. 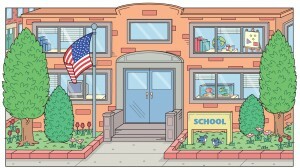 In 1775, many towns in New England closed their schools for the duration of the war. Johnathan and his sister attend a “dame school” for the time being. These are schools run at home by older women in the community. Mistress Robbins has only rough slabs for seats. The younger pupils are taught how to read and sound out alphabet letters. Older ones memorize passages from the Old Testament. Everyone, including the boys, learns how to sew and knit. On a warm spring day, three little girls sit in the music room of their North Carolina plantation home. One is playing a keyboard instrument similiar to a piano. Another is playing the harp, while the third plays a flute. When they finish with their music, the girls ascend a wide staircase to an upstairs room, which serves as a schoolroom. In the schoolroom, children from neighboring plantations join the girls. Several planters in the area got together and hired a teacher for their children. The girls are taught reading, writing, and fine stitching. The boys are taught reading, writing, and bookkeeping. Their lessons last only an hour. 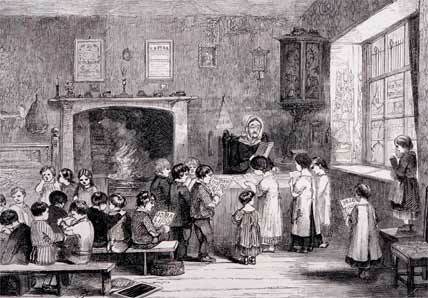 There are few teachers in the Southern colonies, so these children are fortunate to have a classroom. Many Southern children have only “field schools” to attend. Those are informal, infrequent lessons taught in the open fields by some interested adult. Before and after school, children have chores, lots of them. Play was a luxury as there was much to do to survive in those early days. As you leave the homes and schools of 1776 and return to the present day, you sweep past more than two centuries of American history. Not only has the nation changed since its beginning, but so has the manner in which Americans live. The “Can Dos” clapped when the historian finished his talk. 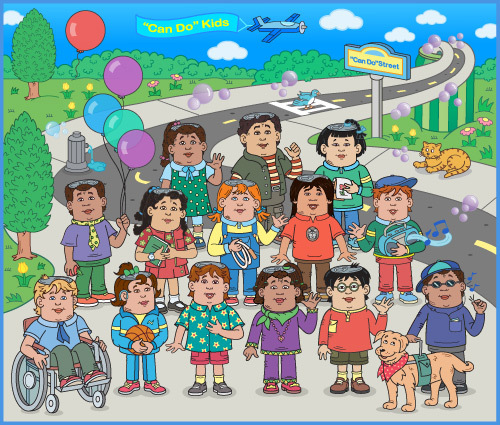 They were silent and thoughtful as they made their way to the fun-filled activities that awaited them…a parade, games in the park, a band concert, a picnic and last, but not least…a fireworks show. Happy 4th Everyone…Happy Birthday America!